The Federal Trade Commission recently announced that it is asking federal courts to enact a permanent ban on affiliate marketers being able to use the fake news site as a marketing method. The fake news site is an advertising method that has long been used by affiliate marketers of various products. They create what looks like an online web page, with the format and content being modeled on legitimate news sources. They present advertising claims and promotions in a way that makes them appear to be facts investigated by a journalist, rather than advertising slogans. In addition, the sites generally use the logos of prominent news providers like CNN, MSNBC, and ABC along with the phrase, “As Seen On.” This is meant to imply to readers that this particular “report” was seen on these websites, when the truth is that the company pays to advertise on the banners of these sites. This purposeful misleading of the public is what led the FTC to its recent decision. In this case, the FTC is specifically focusing on affiliate marketers that promote acai berry health products, however, this is certainly not the only area where affiliate marketers use this tactic. As early as September 15, 2009, Reviewopedia has tried to warn its users about fake news sites. In an article published on that date, we broke down the most common signs of a fake news site, and told our visitors that if a company was using fake news sites to attract customers, that was a major warning sign that the company wasn’t to be trusted. Following that article, whenever we were aware that a company specifically used a fake news site to gain customers, as was the case with Home Cash Flow Solutions and Autopilot Home Profits, as well as Acai Optimum, we tried to bring attention to that on our site as well. We can only assume that the FTC has gone after affiliate marketers using this tactic for the promotion of acai berry products and not at home business opportunities because it will be easier for them to prosecute the acai berry promoters and to build a precedent for further banning this sales technique. 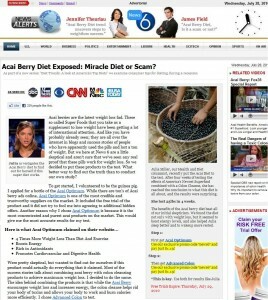 The acai berry promoters are, after all, making unsubstantiated health claims when they say that acai causes weight loss, and as they are passing themselves off as a journalistic source, they intend for their viewers to see these claims as factual. Hopefully, though, the FTC will be able to establish the precedent for how harmful this particular form of advertising is and eventually put a stop to it once and for all. And not just within the health and wellness community, but in the work at home community as well. For more information on the FTC ban, read their special alert here.